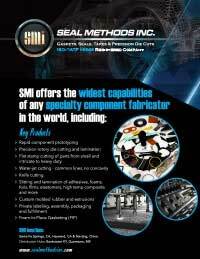 At Seal Methods, Inc. our impressive mix of manufacturing capabilities combined with a deeply knowledgeable engineering and production team make us a leading solutions provider to the electronics industry. We offer an extensive range of custom products for thermal management, EMI/RFI shielding, electrical insulation, bonding, gasketing, and sealing of sensitive electronic devices and assemblies. As a full service provider, we also produce die cuts, laminations, tapes, and other items for traction, masking, protection, and venting. Through long-term partnerships with industry-leading raw material manufacturers, we have access to the widest selection of electrical and EMI films, papers, resins, tapes, foams, adhesives and more. We work with all leading brands of insulating papers and laminates, adhesives, liquid and gel sealants, as well as high performance conductive silicones, phase change materials, and thermal fabrics. Our experienced and knowledgeable staff is available to assist you in selecting the material with the optimal blend of performance properties based on your product requirements. They take into consideration all important factors, including insulation and conductive properties, load and shielding effectiveness, environmental resistances, operating temperature range, compressibility, durability and more to make an intelligent determination of the best material or combination of materials for your individual application. Our manufacturing facility houses a full range of equipment, including automated, high speed, flat-bed and rotary die-cutters as well as multi-layer-capable laminators. We also employ laser, knife, and water jet cutting technologies for rapid component prototyping. Having a Class 100 cleanroom allows us to uphold the highest level of cleanliness and hygiene. Our comprehensive production capabilities also include heat sealing, vulcanizing, rewind slitting, lever slitting, and more. We also offer custom assembly and packaging to meet your end-to-end sourcing requirements. Since our founding in 1974, we have evolved into a diversified converting company specializing in industry-specific, state-of-the-art solutions. To manage our daily operations, we have developed robust and clearly defined manufacturing and quality systems that are ISO: 9001 compliant. We value clients and strongly emphasize the importance of providing a positive and productive customer experience. To learn more about our electronics industry experience and capabilities, contact us today.